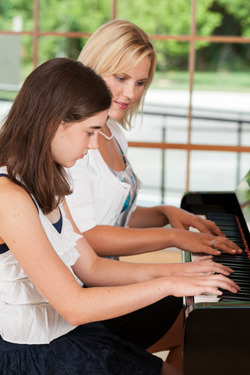 The Perfect Piano Teacher - Piano teachers in Voorhees and Marlton NJ. Piano Teachers In Voorhees, Haddonfield, Marlton & Cherry Hill, NJ. Piano teachers have been traveling to students homes since the introduction of the first piano back in 1709. The process of finding the perfect piano teacher for you or your children depends on a few key factors, as the instrument and teaching methods have come a long way in the past 300 years. Knowing how music schools operate and the differences between in-home and in-studio lesson providers, and the benefits offered by each, will go a long way in helping you not only find the right teacher, but also the right learning environment for your child. Whether you're looking for a private teacher to come to your home or willing to travel to a music studio, it's always a good idea to know exactly what it is your looking for in regard to personality, musical style and teaching experience. As the school director of the Cherry Hill Academy of Piano and Guitar, my job is always much easier when parents ask me a lot of questions. It helps me match students with the appropriate instructor. However, I understand that it's hard to know what to ask in every situation. The topic of musical style is more of an issue with a teen student who owns an ipod and knows what he or she wants to play, versus a 5- or 6-yr-old who has yet to develop any real interest in music. For example, if you're looking for a teacher for your 15-yr-old daughter who is interested in pop music, then hiring an instructor who teaches classical music, exclusively, is probably not going to be a good fit. Finding the right teacher for your son or daughter comes down to asking the right questions when calling around to your local music schools. A simple question like, "Do you teach popular music?" will save your son or daughter from a potentially unpleasant, frustrating experience with a teacher who has no knowledge or interest in your teen's musical tastes. A good follow up question would be to ask the teacher if they are familiar with specific musical artists that your teen has expressed interest in. As a piano teacher myself, I take into account the student's age and how long I may have a certain student before recommending a specific method of study. In regard to younger students between the ages of 5 and 12-yrs-old, I always figure that I'll have a good 5 to 10 years with them, which would lead me to pick a more traditional approach. With teenage students who are just a few years away from going off to college or entering the work force, I won't have as much time, in which case I am inclined to suggest a less formal method of study, such as the chord method. Chord piano is geared more toward contemporary music, and gets students up and playing their favorite songs in the first 6 to 12 months of lessons. The learning curve for chord piano is much shorter, which is why it's perfect for busy teens and adults. Laura Carione brings a level of versatility to the Cherry Hill Academy that will benefit all of her students. With her ability to play and teach piano and guitar, in addition to her vocal talents, Laura has a wealth of musical knowledge that she is eager to pass on to others. Her formal training has prepared her to teach at any level. 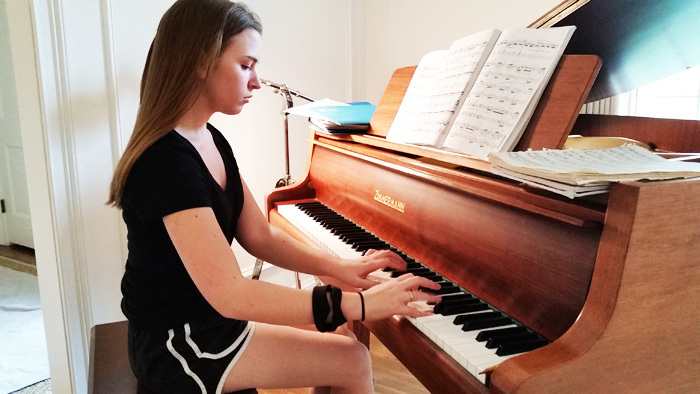 Laura's musical accomplishments along with her enthusiasm has earned her the head piano instructor's position here at the Cherry Hill Academy of Piano & Guitar. We welcome Laura as a new member of our staff and are excited to have an instructor of her caliber and abilities with us.